Imagine that it is the height of the First World War and you are a young Sephardic Jew weighing the options for your future. Whether due to economic motives, the desire to avoid military service or to evade increased anti-Jewish sentiment, you decide to leave your native town of Istanbul, Tekirdag, Rhodes, or Salonica, traverse the Mediterranean Sea and the Atlantic Ocean, and voyage to America, the storied land of opportunity. 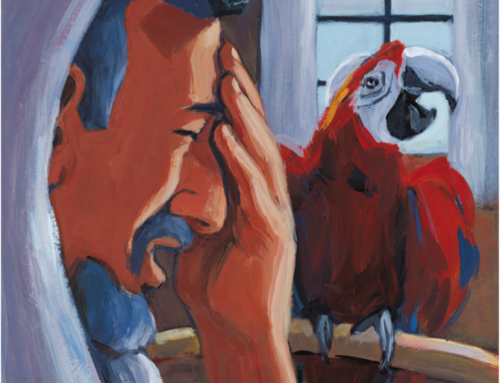 In all likelihood, you know very little about America and, while you speak your native Ladino (Judeo-Spanish) language fluently and might know some Turkish or Greek and maybe even French, you do not speak a word of English. How will you find your way in such a strange, new land? One of the first “treasures” to come to light as part of the Seattle Sephardic Treasures Initiative addressed this question. 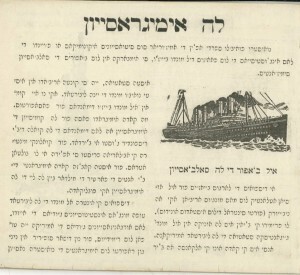 Livro de Embezar las linguas Ingleza i Yudish, published in 1916 in New York, essentially served as a guidebook for Sephardic immigrants in America. The title roughly translates as “Book for Learning the English and Yiddish languages;” its subtitle reads: “very necessary and beneficial for all Spanish Jews immigrating or thinking about immigrating here in America.” Indeed, it most likely was quite useful—at 25 cents a copy. 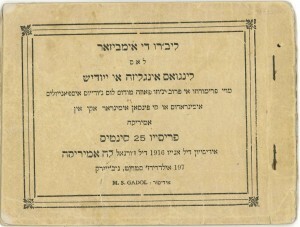 The creator of the booklet, Moise S. Gadol, was the Bulgarian-born founder of the first Ladino newspaper in the United States, aptly named La America. 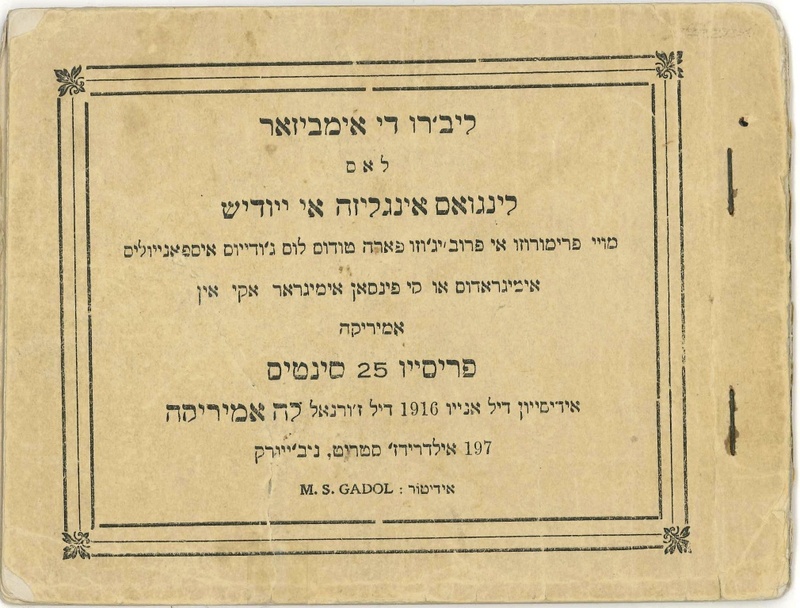 With his booklet, Gadol sought to provide all the basics for an arriving Ladino-speaking immigrant. In Ladino printed in traditional rashi script, he begins by describing the motivation of migration: nuestro puevlo sefaradi afin de amijorar sus situasiones ekonomikas o fuyendo de las indjustisias de los paizes del mundo viejo, se embarka en los vapores de salvasion (“our Sephardic people, in order to improve their economic situations or fleeing from the injustices of the countries of the old world, board the ships of salvation”). Included are illustrations of one of these “ships of salvation” as well as the Statue of Liberty. How can you be sure that you have entered America legally and that you can stay in the country? What will life be like? 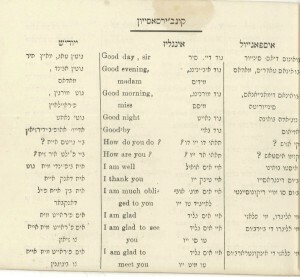 In the booklet, Gadol provides answers to these questions: U. S. immigration laws are translated into Ladino; an appendix presents a study guide for the U. S. citizenship exam in English and in Ladino. A final introductory section explicitly identifies noteworthy aspects of la vida Amerikana (“American life”): benefits of the free market economy, public schools and public parks, ice cream, skyscrapers, the subway, Edison’s Electric Company, the status of New York as “the cosmopolitan city,” and the practice of each immigrant group establishing communal institutions according to place of origin and shared culture—the Sephardic Jews included. 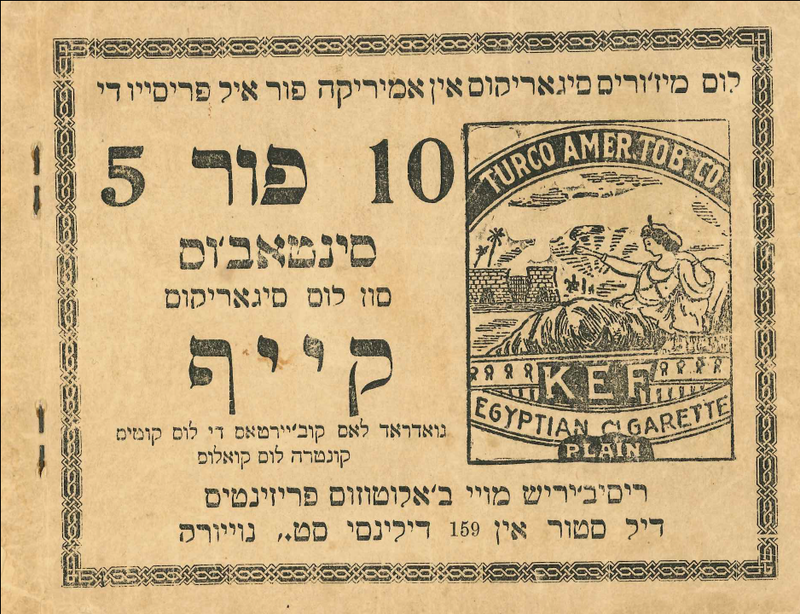 Scattered advertisements in Ladino acquaint new arrivals with a kosher restaurant and a furniture store; a phonograph company selling music albums in Ladino, Turkish, Greek and Arabic; Turkish raki and kosher-for-Passover wines; cigarettes made by the Turco American tobacco company; a dentist, and a doctor—no ay tiempo de estar hazino en este paiz! (“there is no time to be sick in this country!”) Even if you don’t get sick, can you make your way through American society in your mother tongue alone? 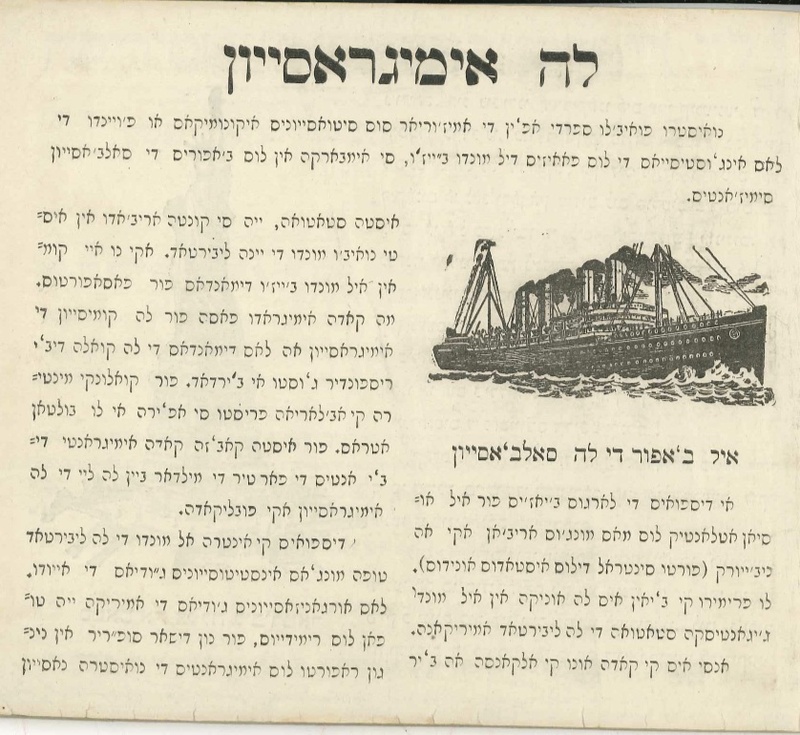 A unique guidebook published in 1916 gives fascinating insights into the mindset of Sephardic immigrants to America. 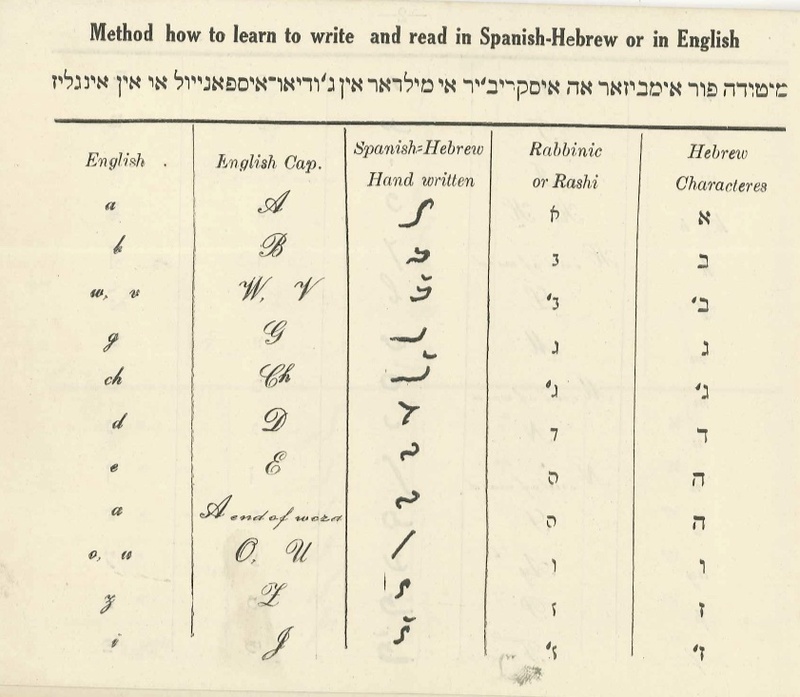 Perhaps most interesting about Gadol’s guide for Sephardic immigrants is its emphasis on learning both English, the language of the country, and Yiddish, understood as the predominant language of America’s Jews. 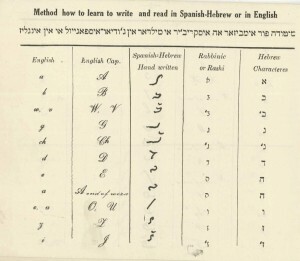 To this effect, Gadol included charts with a side-by-side comparison of the Sephardic (“Spanish”) Hebrew alphabet (also known as soletreo), standard Hebrew alphabets (rashi and block type), and the Latin alphabet, and then provides numerous examples of handy words and phrases (“conversation”) printed in Ladino (“Spanish-Hebrew”), in Yiddish, in English, and in English transliterated phonetically into rashi script. To become part of the general American community, and part of the Jewish American community, Gadol surmised that knowledge of both languages would be necessary. It turns out he was mistaken. 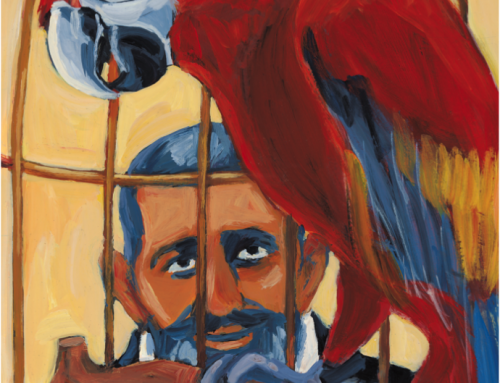 Yiddish virtually disappeared as an everyday language, along with Ladino, in a few generations. 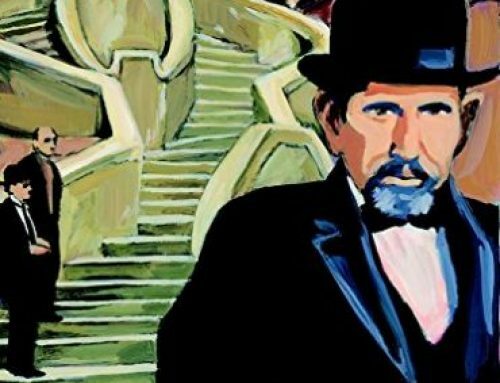 Yet this booklet remains a testament to the belief in the power of language to shape identity and belonging, and to the author’s desire to bridge the divide between Sephardim and Ashkenazim in America. 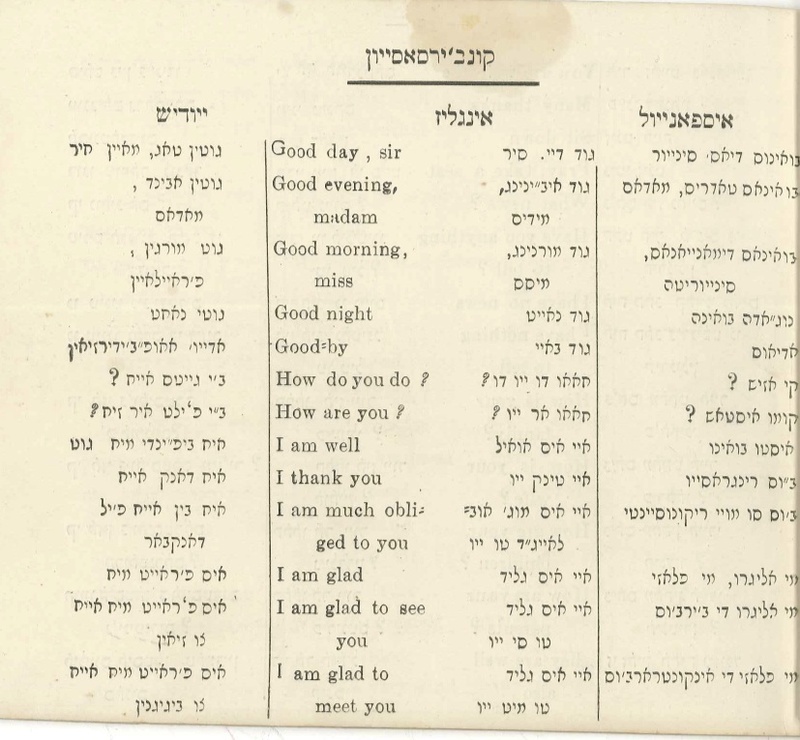 We express our gratitude to one of our own Seattle community members, Isaac Azose, the hazan emeritus of Congregation Ezra Bessaroth, who graciously shared his exemplar of the booklet with the Seattle Sephardic Treasures Initiative to be scanned and incorporated into our digital Sephardic and Ladino resource library—the first of its kind. 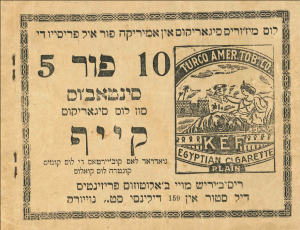 Published in New York nearly one hundred years ago, this booklet found its way to Seattle and provides material evidence of the interconnectivity of the Ladino cultural world in that era. Yet few remnants of that world survive for us today. As it turns out, this is an extremely rare document: according to Worldcat, the world’s largest library catalog, no other complete exemplar of Livro de Embezar las linguas Ingleza i Yudish exists in any American library! 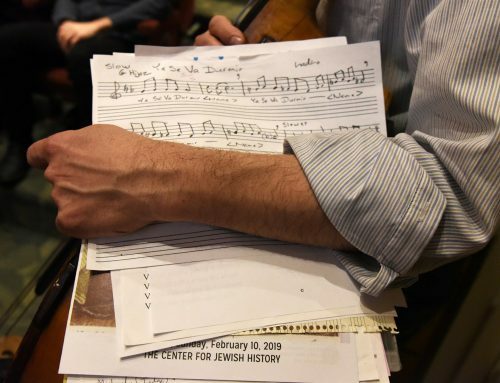 As our readers will continue to discover, Seattle is full of Sephardic treasures just waiting to see the light of day. 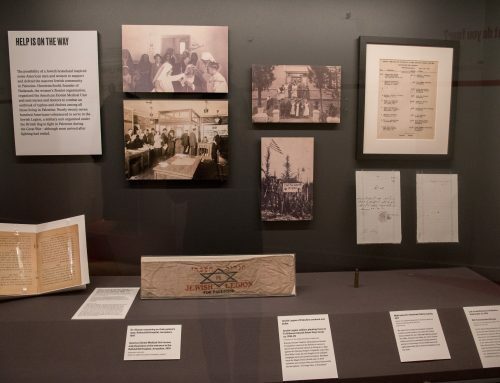 Each treasure opens a new door into the Sephardic Jewish experience and imbues Seattle’s Sephardic heritage with new meaning for us in the twenty-first century. To find out more out the Sephardic Studies Initiative at the University of Washington, click here. For recent international press coverage of Professor Devin Naar’s ground-breaking archival project, click here. 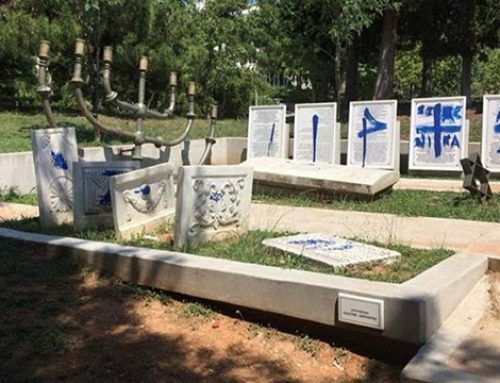 Thank you for keeping the Sephardic heritage alive. Congrats to the University of Washington for having you on staff! Hi, Where do I get a full scanned copy of the book to print out.